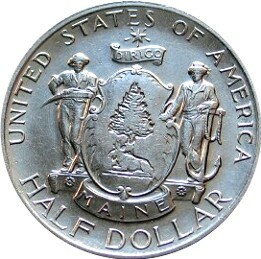 The York County, Maine Tercentenary half dollar was designed by Walter H. Rich and minted in 1936 to commemorate the tercentenary (300th anniversary) of the founding of York County. The reverse shows Brown’s Garrison, the fort around which York County was formed, while the obverse depicts the arms of York County. The York County, Maine Tercentenary half dollar was one of several early commemoratives issued for its local significance. The commemorative was approved largely due to the connections that many of the coin's sponsors had, including numismatist Walter P. Nichols, who was at the time the Treasurer of the Committee for Commemoration of the Founding of York County. The bill authorizing minting of the commemorative passed on June 26th, 1936, at the height of the speculative market in commemorative coins. The sculpting for the coin's design was done by G. S. Pacetti Company of Boston, while the dies were reduced from the original sculpture by New York City’s Medallic Art Company. As Rich's designs were sculpted in bronze rather than the usual plaster, the design has an unusually flat relief more reminiscent of later (late 20th century onward) designs. Although the bill had called for 30,000 coins to be minted, 25,015 coins were eventually minted. With the exception of the first 100 coins, the commemoratives were originally sold in folding paper holders which depicted on their front cover black line drawings of Brown's Garrison and the York National Bank of Saco. Also included were slots to hold up to five more coins, as well as a tissue paper insert that read "We thank you for your interest in our commemorative half dollar, and extend to you the hospitality of York County, Maine. York County Commemorative Coin Commission." The first 100 coins minted, although identical given no special treatment, were sold in a map that depicted "Olde York County Maine" and was mounted in a glass case for presentation. Each was numbered corresponding to the order which the coin was minted. Although sales were initially good, the sales slowed later on in the year due to a collapse on the commemorative coin market. The unsold coins, however, were not melted (as was the case with many unsold commemoratives at the time), and were sold in lots of 10 during the 1950s. ^ a b c "1936 York 50C MS Silver Commemoratives". www.ngccoin.com. Retrieved 10 April 2019. ^ a b c "York County Tercentenary Half Dollar - CoinSite". Retrieved 10 April 2019. 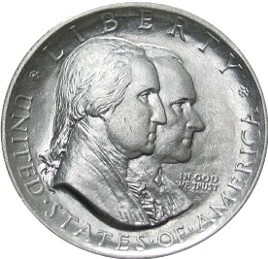 The Bridgeport centennial half dollar commemorative coin was minted in 1936 to celebrate the centennial of the incorporation of the city of Bridgeport, Connecticut. Designed by Henry Kreis, the obverse depicts the city's most famous resident, P.T. Barnum, while the reverse depicts a stylized eagle. The Maryland Tercentenary half dollar was a commemorative fifty-cent piece issued by the United States Bureau of the Mint in 1934. It depicts Cecil Calvert, 2nd Baron Baltimore on the obverse. The Daniel Boone Bicentennial half dollar was designed by Henry Augustus Lukeman and minted during the 1934, commemorating the 200th birthday of frontiersman Daniel Boone. The obverse depicts Boone while the obverse depicts a frontiersman (Boone) standing next to an Indian Chief in front of a stockade on the left and the rising sun on the right. The San Francisco–Oakland Bay Bridge half dollar was designed by Jacques Shinier, a resident of Oakland, and minted in 1936. The obverse depicts a grizzly bear, a symbol of California, and the reverse shows the San Francisco–Oakland Bay Bridge, and the Ferry Building, and two boats approaching the bridge. 100,000 of these coins were minted, of which 71,369 were sold. 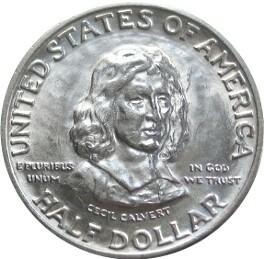 The Delaware Tercentenary half dollar was minted during the 1937 to commemorate 300th anniversary of the first successful European settlement on the site. The obverse features the Swedish ship the Kalmar Nyckel which sent the first settlers to Delaware, while the reverse depicts Old Swedes Church, claimed to be the oldest Protestant church in the United States. Confusingly, while the coins were struck in 1936 and are dated "1936" on the obverse and the reverse also has the dual date of "1638" and "1938", the coins were actually struck in 1937.